CDA Blog > FREE Neverstick pan set promotion extended! 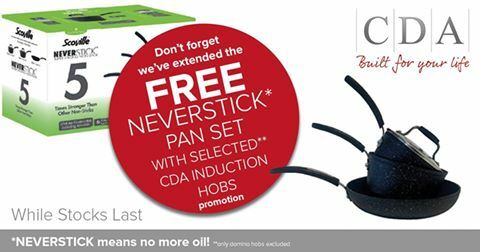 When you buy any CDA induction hob*, you will automatically be entitled to claim a FREE Neverstick pan set. To claim, simply complete the online redemption form here. We will then arrange to send them out to you as soon as possible. You will love using these pans as they are not only induction compatible but completely, seriously and miraculously NON-STICK! Fry an egg, sauté potatoes or even make delicious pancakes with NO OIL required. We have tried these pans out in the CDA kitchen and we really cannot get anything to stick to them. To claim your free set here! *offer valid with purchases from qualifying retailers. Excludes domino hobs. PROMOTION NOW INCLUDES THE HNG7410FR INDU-GAS HOB!